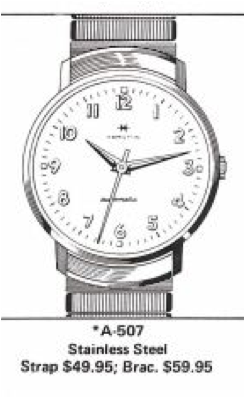 If someone wanted to focus their collecting passion only on Hamilton Automatics, they would assemble a collection of over 150 watches before all was said and done… assuming they could find them all. Add in the dial variations and it would be an even larger feat to pull off. Of course, one might become bored with trying to locate and differentiate the myriad round cases, that automatics typically are found in. 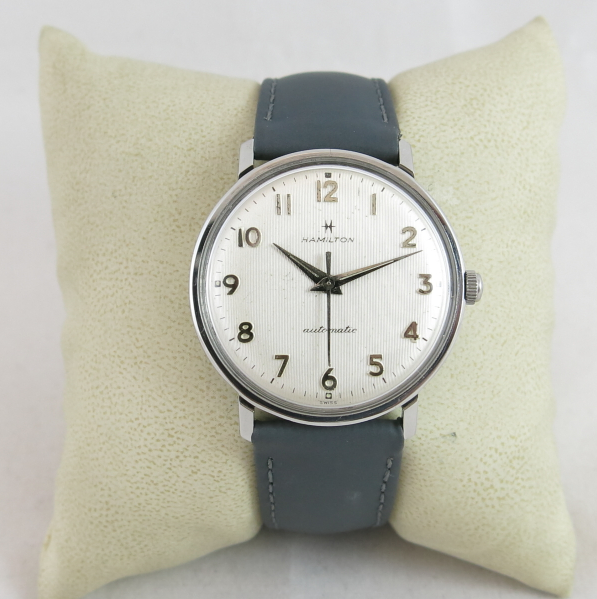 Take for example the 1965 Accumatic A-507. It was produced through the end of US-Hamilton production in 1969 and continued to be offered until 1972. The A-507 comes in a single piece stainless steel case that opens through the crystal. Two different bracelet designs were available, depending on the year. You'll also find different luminous hands. The white embossed dial has a textured finish like grooves with applied numerals and luminous dots at the 12, 3, 6 and 9 positions. 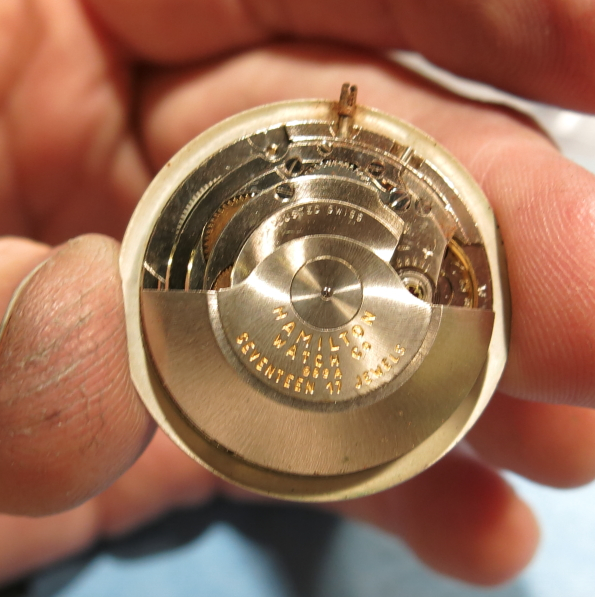 Depending upon the year, behind the dial you will find a 17 jewel Hamilton 689A or equivalent movement. 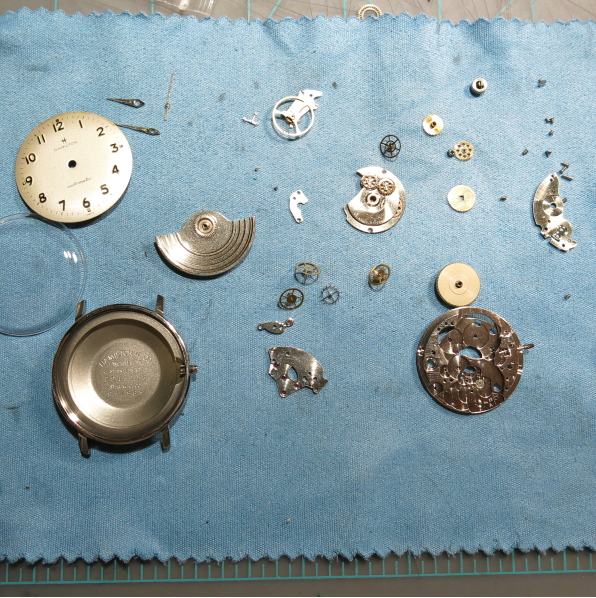 I recently obtained an A-507 project watch that was running but definitely needed a thorough cleaning. The crystal was all beat up and a piece was actually missing by the 12 so a replacement was necessary. 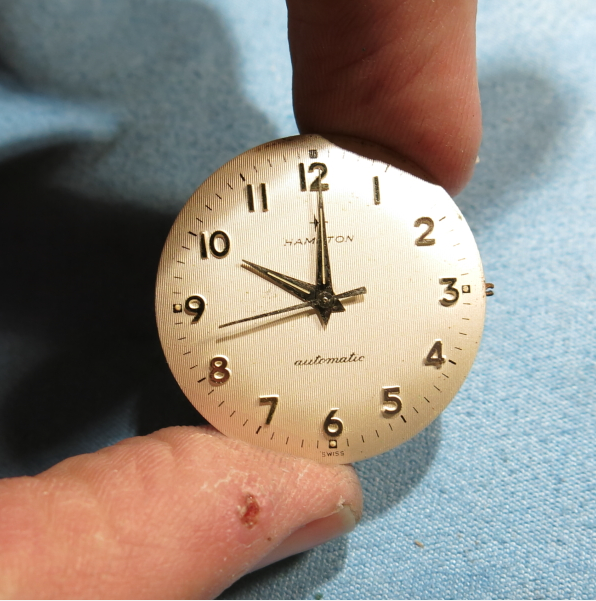 Out from behind the dial, the textured dial is in very nice shape - which is very fortunate since the hole in the crystal could have easily let a lot of moisture and dirt inside. 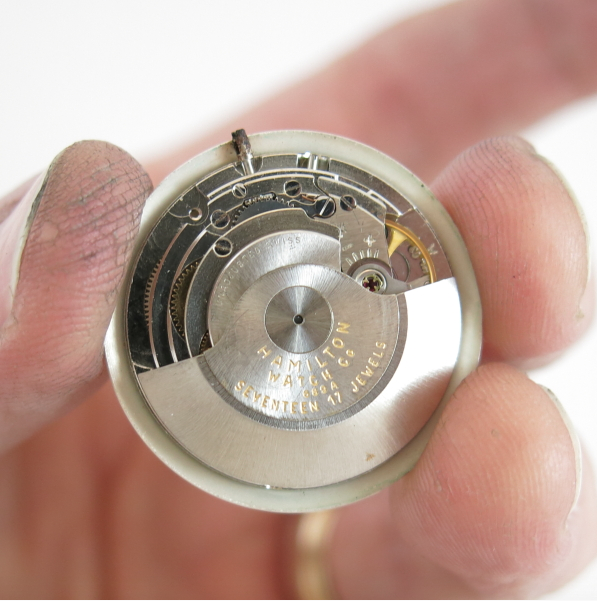 Other than a little minor rust to the female portion of the two-piece stem, the movement is in good overhaul condition. Everything gets disassembled, cleaned and set out to try before reassembly. A little tweaking to the regulator brings the timing into fine control. 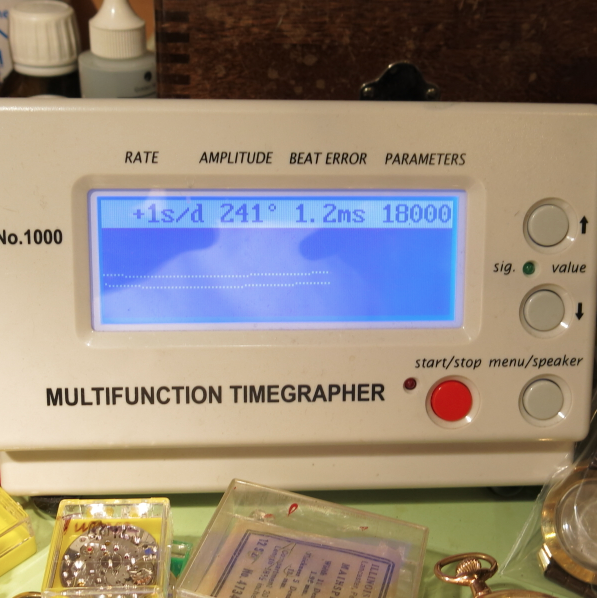 This movement allows for easy adjustment to both the regulator and the hairspring stud for the beat rate and beat error can be effectively managed. The now cleaned movement looks as good as it runs and will go back into the case. And here's the finished project, with a fresh crystal and a new gray leather strap. This is a very clean design and reminds me of photos of working men in the 1960's with narrow ties and blue suits. It's a sharp looking and simple design. I finally found out what model my Hamilton is! 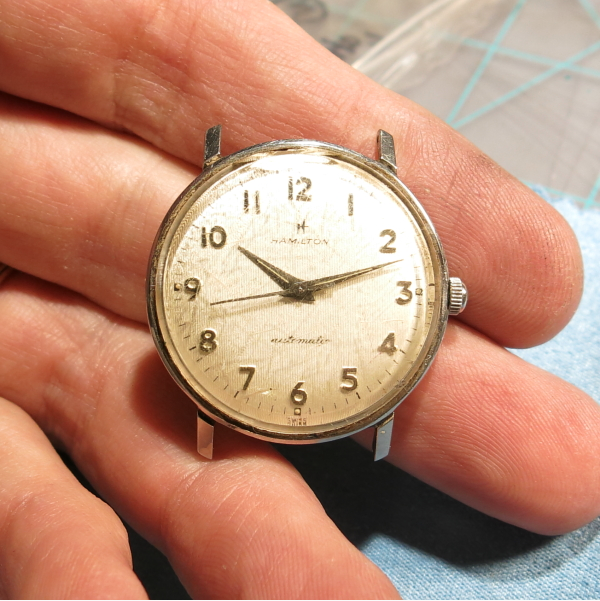 It was my Grand Fathers and it my everyday watch keeps spectacular time. It is Lancaster made, and I have had may of my family work at Hamilton. 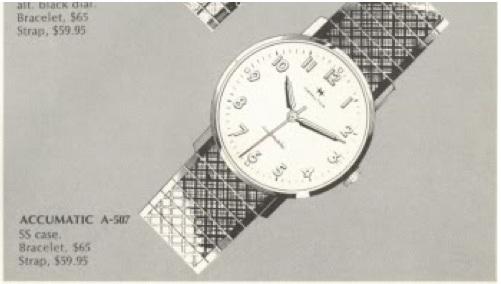 Just curious if you would know what size crystal this watch takes? I have one that needs a replacement and am looking to order one. Thanks! Nope. You’ll have to measure yours to the nearest 10th of millimeter.